Christopher Chabris and Daniel Simons met at Harvard University in 1997, where they began to collaborate on research. In 2004 they received the Ig Nobel Prize in Psychology, awarded for "achievements that first make people laugh, and then make them think," for the experiment that inspired their book The Invisible Gorilla (HERE). 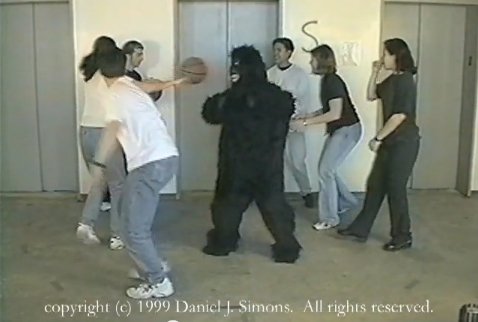 The classic Gorilla selective attention test by Chabris and Simons involves a short video of about 6 people, 3 dressed in white and 3 in black. The people in the video are passining a basketball between themselves whilst moving around. Participants in the test are asked to count the number of passes of the basketball between the team dressed in white shirts. During the video a person dressed in a gorilla suit walks across the scene, turns to camera and beats his chest. Only 50% of test participants see the Gorilla. A still from the video is shown below.